The 9th December marks the 5th anniversary of the designation of the Northumberland International Dark Sky Park. At 572 square miles (1,483 square kilometres), over the Northumberland National Park and Kielder Water & Forest Park, it is Europe’s largest area of protected night sky. On a clear night, look up to the spine tingling view of up to 2000 stars at any one time. Celebrate the anniversary with the stars; there are many places in Northumberland where you can marvel at a star-studded show without it costing the earth. What do village halls, car parks and picnic sites have in common? Several have been designated as Dark Sky Discovery Sites, perfect for viewing the night sky. They offer good sightlines of the sky and have good public access, including firm ground for wheelchairs. Twenty dark sky discovery sites are dotted throughout Northumberland; to mark the 5th anniversary we’ve selected 5 within the Dark Sky Park. Stonehaugh Stargazing Pavilion is a striking timber pavilion designed and built by students from Newcastle University. Accessible 24 hours a day, the pavilion is located in a clearing on the edge of woodland and is accessible to wheelchairs, although the surrounding ground is on a slight incline. Can you spot the sparkling star constellation Orion this winter? By day Elf Kirk Viewpoint in Kielder Water & Forest Park offers dramatic views over the lake and, when the sky is clear, Deadwater Fell on the Scottish Border can be seen. Visit on a crisp unclouded night and you’ll be amazed at the peacefulness and the outstanding views of the night sky. If you are camping at Kielder, the Warm Room, a contemporary timber structure, offers sheltered space and electrical charging points as well as a sheltered external cooking area. Ingram is located in the beautiful and remote Breamish valley of the Cheviot Hills, high in the north of Northumberland National Park. Impossibly picturesque by day, Breamish Valley is a stargazer’s dream spot. You’ll feel like you’re the only person for miles – perfect for taking in the magnificence of the vast night sky above you. Parking is located at nearby Bulby’s Wood. Dramatic during the day and spectacular at night, Cawfields is a former quarry along Hadrian’s Wall. Built by the second legion to protect the weak spot of Hole Gap, it hangs on to the edge of the sheer crags. Enjoy a daytime stroll along to Milecastle 42 or if you are feeling more ambitious it is 6 miles to Housesteads Roman Fort. 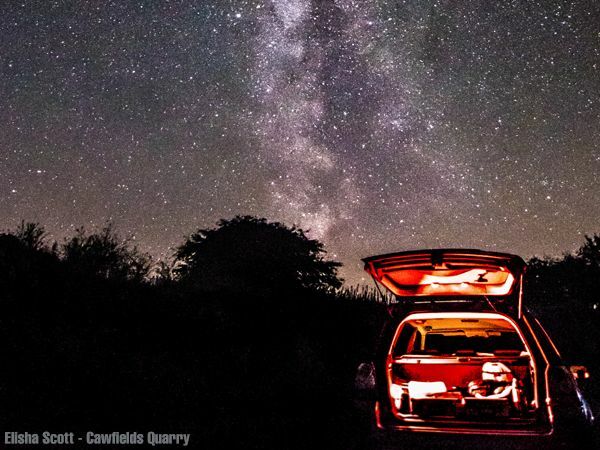 The car park at Cawfields is an excellent place to view the dark skies of the Northumberland National Park. Be blown away by a bright nebula in winter months. The Sill, named after the famous Whin Sill, upon which the Emperor Hadrian built his wall, is the UK’s National Landscape Discovery Centre at Once Brewed in the Northumberland National Park. During the day enjoy panoramic views from the fully accessible grass roof with viewing platform overlooking Hadrian’s Wall, indulge in coffee and cake at the café and explore our landscapes and heritage at the free exhibitions. At night the car park offers a great dark skies viewing point.